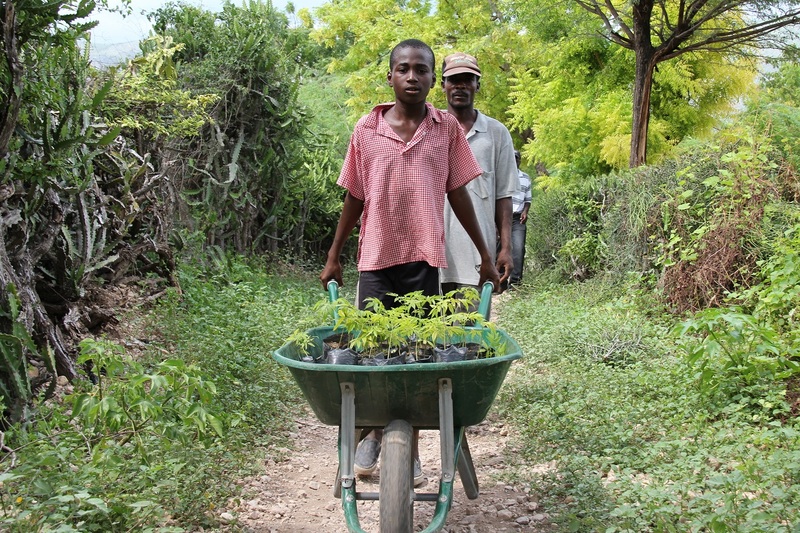 Last year we reported on a very successful social business that helped reforest the Caribbean island of Haiti while simultaneously increasing farm productivity and household incomes. The program, which was managed by the Smallholder Farmers Alliance (SFA) and supported by outdoor footwear and apparel manufacturer Timberland, developed an innovative and replicable model for creating environmentally-friendly economic development opportunities that truly benefited the island’s residents. Rather than resting on their laurels, the partners are in the beginning stages of their next social business venture: reintroducing cotton to Haiti in a way that’s sustainable and benefits farmers with small landholdings. The idea of growing cotton on Haiti came up during Timberland and SFA’s original collaboration. Timberland wanted to encourage locals to produce sustainable raw materials for the company’s products. SFA wanted additional opportunities to help farmers grow their incomes and businesses. Cotton was once the fourth-largest export from Haiti. The country produced extremely high-quality fibers that were coveted by manufacturers all over the world. A number of internal and external factors caused the industry to collapse in the 1980s. Timberland uses cotton in nearly all of its products (including its famous shoes, garments, bags and other accessories), so they were intrigued by the idea of purchasing cotton from Haitian farmers. Given that thirty years had passed since the industry disappeared, Timberland and SFA wondered: Had things changed enough that cotton could once again be viable in Haiti? They commissioned Impact Farming, a nonprofit that supports small farmers worldwide, to study the issue in more detail. In November 2016 the organization released a report called Cotton: Export Market Potential for Smallholder Farmers in Haiti. The 85-page document provides a detailed analysis of the feasibility of growing cotton on small farms in Haiti using a social business model. Their findings were largely positive. Haiti still has the ideal soil and environmental conditions for growing cotton. That’s likely to be the case even as climate change continues to alter weather patterns on the island. Cotton has often been criticized because it requires frequent applications of pesticides and insecticides, needs lots of water, and is commonly grown from GMO seed. But a sustainable cotton industry has cropped up in recent decades, and researchers have developed numerous best practices for growing the plants in a more eco-friendly manner. Advances in technology and farming practices mean cotton can be grown with less water and fewer chemical inputs. Although the poverty of most Haitian farmers puts them at a disadvantage in many ways, they have some unexpected advantages when it comes to producing organic cotton. Most farmers are too poor to purchase expensive pesticides, which means their crops are already organic. And genetically engineered seeds are banned in the country, so there’s no risk of cross-contamination with farmers using GMO seeds. Consumer and brand interest in environmentally-friendly products is increasing all the time, which is good news for farmers concerned about demand. Sustainably-grown cotton made up about eight percent of the total cotton market in 2014 and was expected to increase to 13 percent the following year. Timberland, as well as companies such as Adidas, Nike, H&M and IKEA, have all committed to buying 100 percent of their cotton from sustainable sources by 2020, which will help create new markets for organic producers. Bringing cotton back to Haiti has its challenges. Although SFA has done a phenomenal job of building the capacity of local farmers and establishing a successful social business model, organizing the 500 growers with small landholdings needed to create a world-class cotton industry will require a new level of organizing and buy-in. The project will require some infrastructure development, most notably the purchase and installation of a cotton gin (which is not something you can pick up at a local farm supply store). While there’s still global demand for cotton, supply is also increasing, which can lead to market gluts. Haiti isn’t particularly well-positioned to access shipping ports for commodity crops. And there isn’t a great system in place for tracing the origin of cotton as it bounces between processing centers, cargo ships and factories. The Impact Farming report shared that only 17 percent of sustainably-grown cotton is kept separate and marked as such. The remaining 83 percent gets mixed in with conventional cotton and doesn’t fetch higher prices. Even with these drawbacks, the report recommends that Haitian farmers move ahead with an organic cotton growing scheme. Among the authors’ specific recommendations are that farmers grow cotton collaboratively within a social business framework; that they set up a centralized facility to gin the fibers; and that they develop a brand so their product is identifiable and fetches a higher price. What’s next for a social business focused on cotton in Haiti? Now that the report has been finalized, what’s next for Haiti’s nascent cotton industry? Hugh Locke, president and co-founder of the SFA (and president and founder of Impact Farming), is working with the Université Quisqueya, a private university, to establish a chair of cotton studies at their school of agriculture. “The reason that’s important is that we’re going to be working with Quisqueya to design a series of field tests,” Locke said. “This will involve testing different seed varieties of cotton in three different locations, and in each location we’ll be testing it on irrigated and non-irrigated land. We’ll be doing that because we need to provide Timberland with samples for them to be able to identify which variety they would like because it depends on fiber length and color and various other attributes. Locke and other local partners will also be gauging farmers’ interest in participating, locating a cotton gin and getting it installed, and working to develop those critical international buyers. That’s one way Timberland will support this project going forward. The brand is likely to be an early purchaser of Haitian cotton. They’ll also be spreading the gospel of how the product can help other brands meet multiple corporate social responsibility goals (all while getting superior fibers). Although cotton bundles won’t be arriving on Timberland’s loading docks for several years, there’s already some early discussion about how it might be used. The Haiti cotton project will go a long way toward meeting Timberland’s aforementioned goal of ensuring all their cotton comes from sustainable sources. But it has larger implications for their corporate vision and goals. She refers back to Timberland and SFA’s original project to bring trees back to Haiti. The country went from being 90 percent deforested to becoming home to 4.9 million new trees. Farmers have seen average increases in crop yields of 40 percent thanks to the trees’ ability to provide food, shade and protection against erosion. Because the project utilized a social business model, average incomes among the country’s poor farmers has increased 50 percent – which means there are 3,400 more children whose families can afford to send them to school. Haitian cotton, she believes, holds the same potential to hit the triple bottom line of helping people, profit and planet.